Disainiosakond was founded in 2011. It seems to have been a rather proliferous year for the creation of design bureaus, because the same year has popped up in several other similar interviews regarding their outset. ▶WHO: Disainiosakond, disainiosakond.ee ▶PARTNERS: Kristi Rummel ▶HOW MANY: 3 Designers and a Process Manager ▶WHAT: design of public space, information design, signage ▶CLIENTS: Tallinn Transport Department, Port of Tallinn, Tallinn City Transport Ltd., Tallinn City Enterprise Board Disainiosakond believes in sustainable mobility and a user-friendly city space. Disainiosakond design studio began with the aim to create responsible design and along with that make the surrounding city space more human-centred. The studio springs from the Estonian Academy of Arts' city development and approachability project “Tallinn For All” and from the personal experience of the graphic designers in the environment surrounding them. The main focus of the design studio is user-centred design in public space. The founder of the studio, Kristi Rummel, the Designers Brit Pavelson and Norman Orro, and Process Manager Anu Leisner are all working to produce the best possible outcome for society with the help of design – either for an inclusive city milieu or healthier and happier citizens. Disainiosakond developed a new identity for Tallinn Transport. In collaboration with the Port of Tallinn the studio is endeavoring to create a comfortable, natural and uninterrupted user passage for the ferry travellers into the city centre. Hopefully, the results of the project, impelled by Design Bulldozer can already be seen at the end of this year. 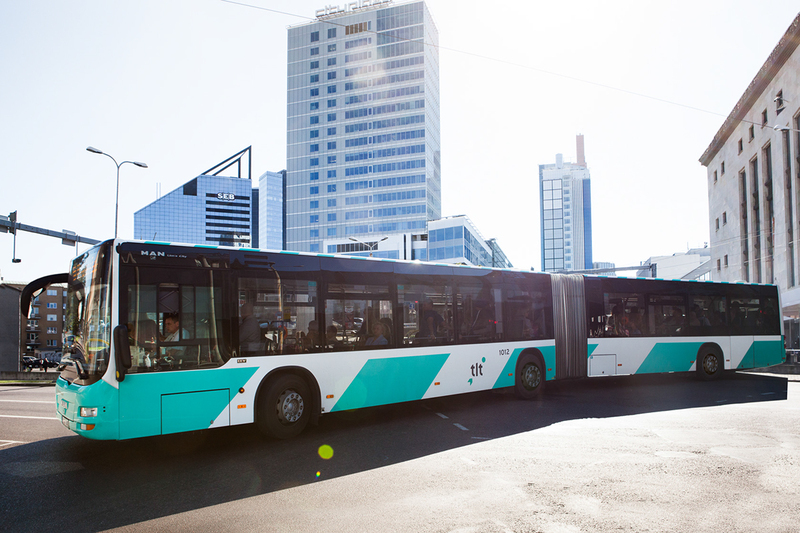 With Tallinn Transport Department and Tallinn City Transport Company they are collaborating for the fourth year to make the public transport in the city a transparent, logical and complacent means of transportation for the passenger. Services of Disainiosakond Disainiosakond also has independent initiatives. One of these projects is a map of all Tallinn public transport routes in the likes of the London tube map, which the studio is developing and circulating itself and which you can find in different Tallinn information brochures. 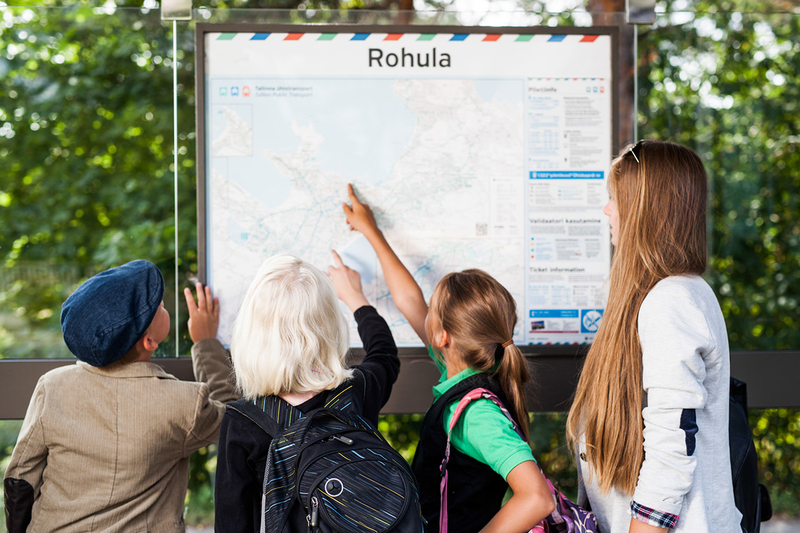 Tallinn Transport schematic route map Success stories will take years When Disainiosakond first presented the idea sketch for the unified design for Tallinn Transport vehicles three years ago, it was rather unsure whether the vehicle lot could change anytime soon. But steady diligence pays off and by the end of 2015 one can already detect as many as 100 buses with the new design. In the private sector, we can see such changes happening much faster. In the public sector, updates have to be made with limited resources and in a territory with different interests. Many details in the city space are determined by law, decrees or standards, in the establishment of which the designer has not been considered, but must still follow in work. For example, according to the standard, the font for all Estonian traffic signs is Arial, which, however, is definitely not the most legible type for the city environment. Several European countries have cultivated a font best for the local language signage. In Estonia, too, we have good typographers, for example, Anton Koovit, who could create a unique font best suited for our environment and language space. New bus design of Tallinn Transport Icebreaker The well-known London transport design got its system and logic already in the 1920s – meaning that behind their today's image there is about a hundred years of design development. 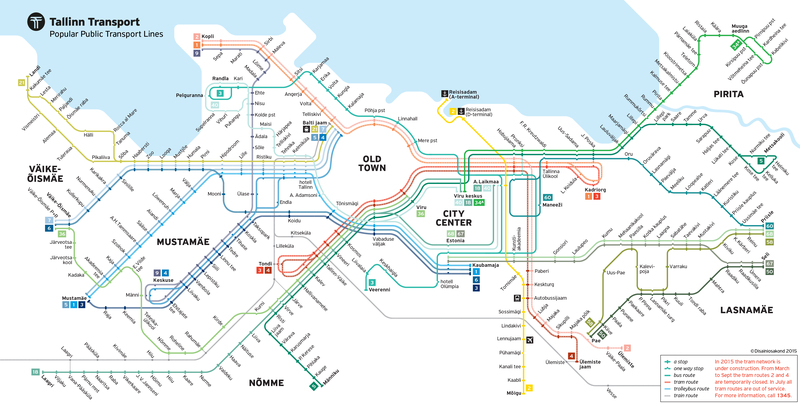 In Tallinn, we had a chance to start off from a rather unexplored area, because previously, Tallinn public transport had not been designed as a unified service. By today, the unity of the service of Tallinn Transport is more and more visible in the city space. Disainiosakond is working on every project from the initial problem setting until the very last details of solution and supervision. 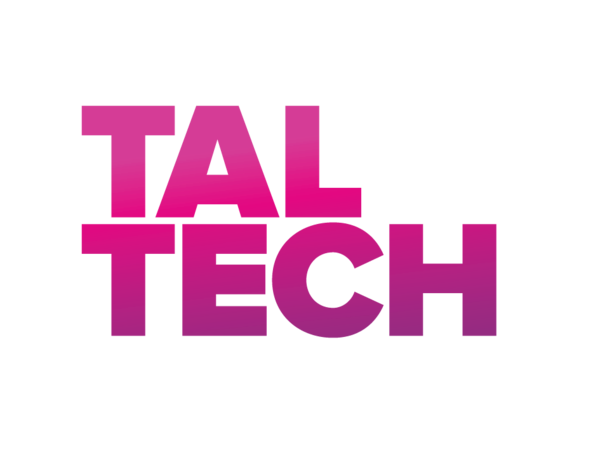 It is important that the whole team of clients would believe in the design solution and would see how it makes their job easier. Only this way Disainiosakond can create sustainable solutions. Design supervision in the tram depot The trust between the designer and the client plays an enormous role. The less we need to persuade the client in the importance of design, the more we can focus on the development of its fundamental content. Design proves itself faster where user feedback is direct and more measurable, for example – the decreased workload on the helpline justifies the necessity of change. Usable and systematic ticket information Public space around the entrepreneur Today the clients of Disainiosakond are the public sector and state companies, as they have the most impact on public space. Then again, every private business has a part in developing public space, too. Consider, how many of us have had difficulty in finding a convenient way out from a huge shopping centre or getting to the right place in an industrial territory. Many companies solve the questions of signage with introducing a visual identity. The planning of signage could begin earlier in the process and find such solutions in collaboration with architects and interior designers that would be aesthetic as well as emanate from the principles of universal design. Thus, even companies can contribute to an inclusive and user-friendly public space. 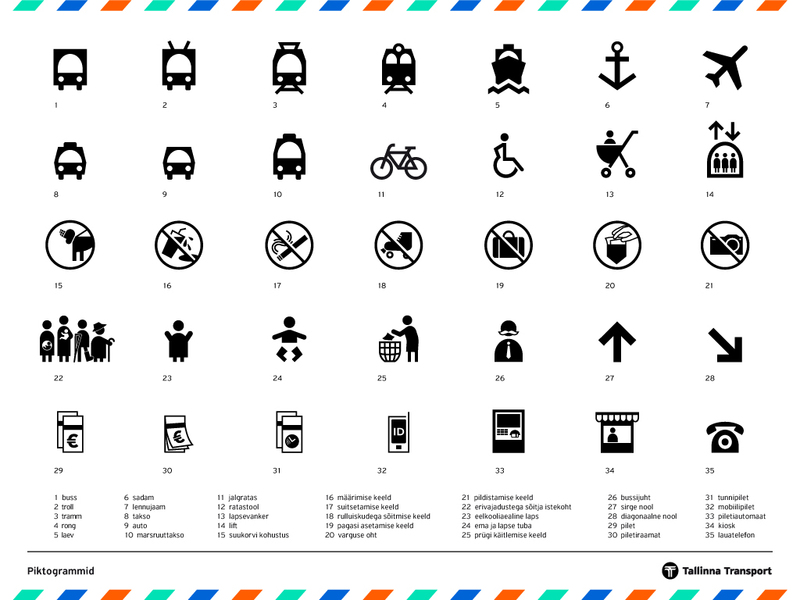 Tallinn Transport pictograms The perfect landscape The good city space examples Disainiosakond mentions come from Scandinavia, where the focus is on people: they are the ones who developments are based on. In an ideal city, people can easily find a way to travel to their destinations in a convenient way, choosing the mode of travel depending on function, rather than its reputation. In the future, Disainiosakond can also export services, above all to Eastern European countries, where the near future city progress is in the same pace with ours. In Estonia, Disainiosakond would like to take part in projects with the Estonian Rescue Board or create a unified system for bikers or in the operation of taxis.